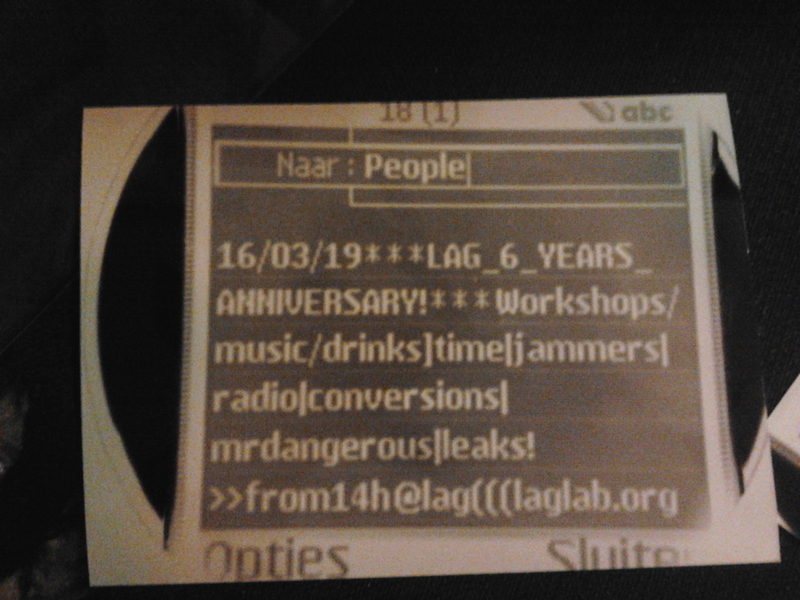 Today we get together for the 6th anniversary of LAG. Celebrating the )time( of our )space('s enduring existence through [time] we will start an investigation into the politics of [time], ]waves[ and [space]. We will make these big issues approachable by proposing a series of tools and experiments which will allow us to materialise the technological infrastructure of time. This will include looking at different time signals and time syncronisation mechanisms such as radio time, network time protocol and GPS time and the way these technologies keep and order the time which keeps society ticking over. By materialising and experimenting with the different physical layers and discussing the history and ideology they embody, we'll analyse [time]'s power over us and refute its claim to absoluteness. The flow of the work session will take different paths and allow for plenty of leaks and drifts (through the radio spectrum) depending on the urgency and interests in the room. And as always in LAG the accumulation of [distractions[ and interferences will overflow into drinks and music. Come to reappropriate time and the radio spectrum and enjoy good company, deviance, inefficiency and perpetual leaks!! !